I left Negreira around half past seven.. it was still dark and I didn’t quite know which way I should go.. I managed to get through the village and was offered an alternate route through a very dark and sinister looking forest.. I decided the road way would be kinder on the nerves.. 1km along the road the path took me up into a dark and sinister forest anyway. There were no other pilgrims around (they were probably all brave enough to take the first option) and so I walked alone into the darkness.. after a few minutes my mind was working overtime trying to scare the life out of me.. every tree looked like a shrouded figure.. every bush a wild animal with dripping fangs… I decided to get my walking pole at the ready and moved stealthily along the path.. just as I was wondering what it would feel like to have my scalp torn from my skull by a rare Spanish mountain lion the bushes rustled beside me. I swung my pole and followed up the attack with a small scream and two karate kicks in the general direction.. anyway, the animal never appeared but I guess I’ll never know if it was lion,bear, vampire or mouse.. I quickened my pace and covered the next couple of km in record time.. luckily without further molestation.. The sun rose, my pace eased off and I cleared the trees alive.. the next 15 km rolled past me at a non life-threatening leisurely pace.. I decided to stop at Santa Mariña in an albergue called Casa Pepa.. It’s pleasant enough.. 16 beds above a bar that serves a decent enough pilgrim meal for 8 euros.. Into cubicle.. throw clean clothes over top of door to try keep them dry. Take off smelly clothes. Also throw them over top of door because don’t want them soaking up water from the floor.. knock clean trousers off doortop and have to spring out of cubicle naked to retrieve trousers.. angle shower away from clothes which means none of the water actually got me either.. use contortionist skills to get wet while trying to get clean.. finish rinsing and congratulate myself on keeping clothes dry.. knock shower head from its holder and spray everything while trying to wrestle it back into place. Fix shower, turn round and realise I’ve knocked clean clothes onto floor and they have soaked up the entire tray of water.. give up and put wet clothes on.. So here I sit.. clean but moist.. and most importantly alive even after risking life and limb in the forest.. tomorrow is a short 16km day.. I’m hoping the facilities are slightly better laid out but who knows? 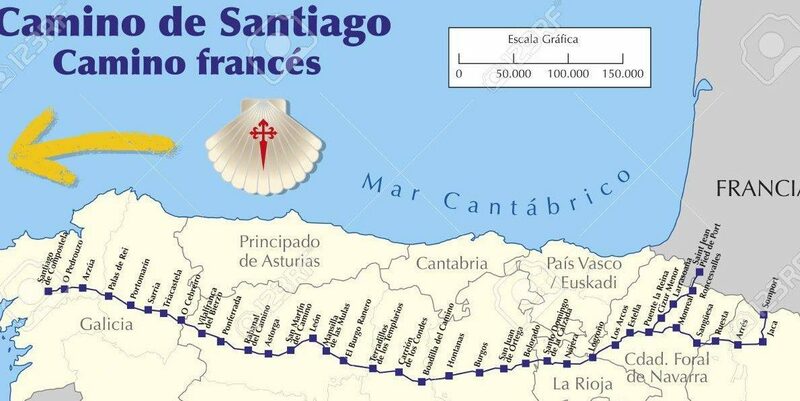 The joy of the camino is overcoming these bumps in the road.. 48km to Finisterra! Andy, you have me smiling! I had my 23 year old daughter with me so no overreacting to lion like shuffles from among the bushes..
We stayed at casa pepe too and enjoyed the place but remember those showere stalls as being some of smallest over the e ntire length. Of camino. We too stayed at casa oeoe , a nice olace in. The middle of nowhere. And yes small showers. Albergue moriera. Nice hospitaliero even if we did get locked in. A first for us over 800 km. Apparetnly the key eas given to last arriving oilgrim who was esconced. With his fmaily in upstairs private suite. So thru the window it was. Gold star of valour Amigo. That’s what I award you. Not for the solo walk through dark and menacing lion and bear infested forests but for doing battle with the elements, Spanish plumbing in cubicals built for midgits. Hang in there…..the end is tantalisingly close. ha ha ha, I miss you! I didn’t encounter the Spanish wildlife other than lizards, but tiny shower stalls, I had a few. Thanks for the laughs, Buen Camino!